(AP Photo/Summer Ballentine) Bishop W. Shawn McKnight, of the Roman Catholic Diocese of Jefferson City, Mo., speaks at a news conference Thursday, Nov. 8, 2018. McKnight released a complete list of the names of 33 priests or religious brothers in the Jefferson City diocese have been "credibly accused" and/or removed from the ministry over sexual abuse of minor. This follows an internal investigation that began in February 2018. Jefferson City, Mo. 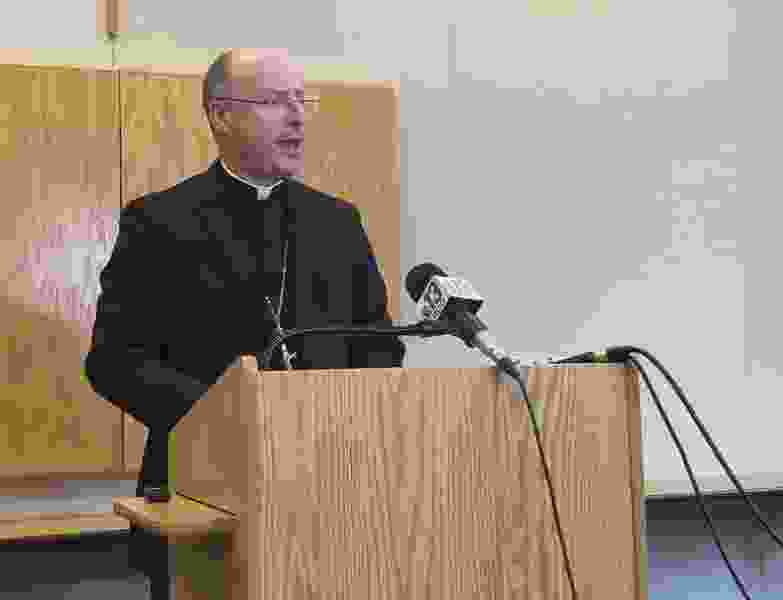 • Thirty-three priests or religious brothers in the Roman Catholic Diocese of Jefferson City, Mo., have been “credibly accused” and/or removed from the ministry over sexual abuse of minors, the bishop of the central Missouri diocese said Thursday. Bishop W. Shawn McKnight released a list of the names that followed an internal investigation begun in February. The tally includes 25 priests from the diocese, three priests from other areas who previously served in the Jefferson City diocese and five members of a religious order. AP reporters Margaret Stafford in Kansas City, Mo., and Jim Salter in St. Louis contributed to this report.